In September, 2017, we dedicated our Gratitude Garden on the grounds of the congregation. 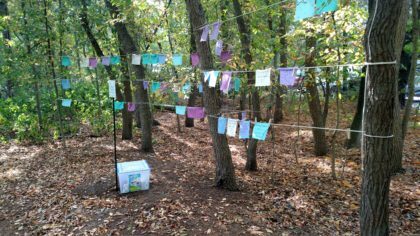 This interactive installation provides a place where people from the community can share thankfulness publicly, yet anonymously — a powerful gift for the givers, the receivers and our world. The Garden is dedicated in memory of long-time TUS member, Mildred Romero. Visit the Gratitude Garden Page for more information.